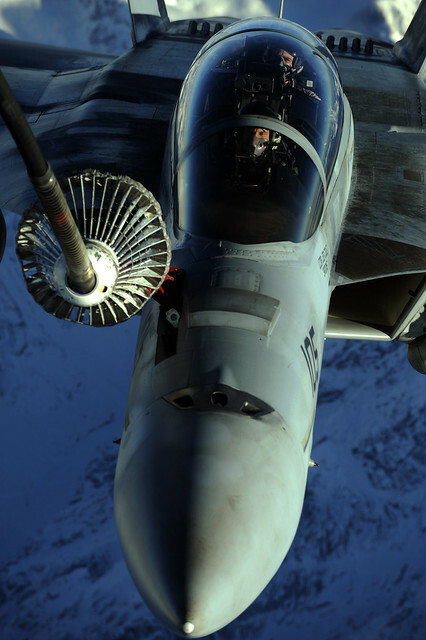 A US Navy F/A-18F Super Hornet refuels over Afghanistan. U.S. Air Force photo by Staff Sgt. Michael Keller. This is a major change of strategy. Under Petraeus’ predecessor General McCrystal’s air strikes were severely limited in an effort to avoid the Afghan civilian casualties that undermine the legitimacy of the central government and enfranchise the message of extremists. This is also a personal shift for Petraeus- after assuming command of the NATO effort in Afghanistan he affirmed that he would keep the restrictive rules of engagement, despite their lack of popularity among ground troops. Why the change in strategy? Most observers believe that Petraeus’ shift back towards a strategy of overwhelming force and away from the complexities of counterinsurgency is an attempt to force Taliban commanders towards a negotiated peace with the central government in anticipation of the looming US withdrawal from the country. Whether this will be effective is uncertain. Despite recent losses the Taliban remain firmly in control of the Afghan status quo- if the United States withdraws without significantly altering the country’s current state the Taliban will eventually regain power, and massive bombing campaigns can’t change that. Additionally, this shift hints at desperation within the US war effort. The Obama administration has made it clear that it desperately wants the situation in Afghanistan stabilized enough to at least allow for a dignified US withdrawal in 2011. However, the escalation of the air campaign seems unlikely to accomplish this. If past experience is any guide air power isn’t related to victory in an asymmetrical war. During the closing days of the Vietnam War the US tried a similar strategy, and while the massively destructive Operation Linebacker II did succeed in forcing the North Vietnamese leadership into accepting the concessions that allowed for a US withdrawal it did little to damage North Vietnamese military prowess over the south or incentive to continue fighting. Of course these two situations are vastly different. While Linebacker II targeted a sovereign nation with clear motive to protect its national assets the Taliban have no such incentive. Additionally, In fact, because every civilian death in Afghanistan strengthens the ideological draw of the Taliban the continued air campaign could serve to strengthen their position, not weaken it. It seems at this point that that’s a risk Obama and his commanders are willing to take. They’re out of options.